This is the story of Cornwall's ancient past; wrought in quartz, elvan and granite and, for the most part, seemingly oblivious to the storms and tempests of the past few millenia. Cornwall has a special place when it comes to antiquities. It has an abundance of monuments, especially those of the prehistoric ages, and the sheer desolation of its moorlands have shielded many of the stone monuments of its distant past from destruction. Not so the organic matter which was often buried alongside or within these monuments; the acid soil has a fondness for supreme decomposition. No matter. The bodies rot but the stones remain. We need not the body of Da Vinci that we may appreciate his creations. The creations achieve immortality in a way that flesh can but dream of. 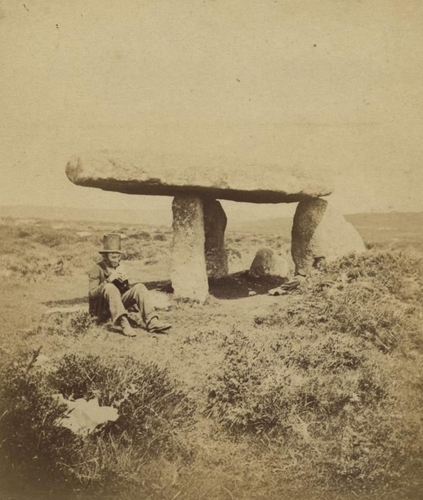 This modest collection of photographs, illustrations and texts will give but little indication of the true nature of Cornwall's ancient monuments, and of the profusion of its stock in this respect. It is but a small piece of the jigsaw. I remember, as a child, visiting the courtyard settlement at Chysauster and attempting to comprehend the vast span of time between the creation of it, and of me. It was then that I remembered a game that most of the children at one of my primary schools in the north of England had played at break time a few years before my visit to the courtyard settlement. The children had, unconsciously to my mind and with no input from the teachers, constructed a crude settlement of small houses, in reality just low walls. They would barter with rocks of differing sizes. On reflection, it seemed to me that the vast span of time between Chysauster and I were not so great after all. Please note that this website is copyright of Chris Bond, and that some of the images reproduced here, with permission, are the copyright of other persons and organisations, and that no material from this website should be reproduced elsewhere without prior permission being given.